Meconium aspiration syndrome (MAS) happens when a newborn inhales meconium (the baby’s first stool) and amniotic fluid (the fluid that surrounds the unborn baby). It can happen before, during, or after labor and delivery. Newborn babies with MAS have trouble breathing. They may breathe too quickly, grunt when they breathe, or use extra muscles to catch their breath. Their skin may have a bluish tint due to lack of oxygen, or a greenish tint from meconium staining. Their blood pressure may also be too low. What causes meconium aspiration syndrome? Meconium aspiration syndrome is caused by the baby’s first stool (feces). It also is caused by amniotic fluid (the fluid that surrounds the baby while in his or her mother’s uterus). It’s dangerous when the baby inhales either of these substances into his or her lungs before, during, or after birth. How is meconium aspiration syndrome diagnosed? Several signs indicate MAS. Before birth, the fetal monitor may show a slow heart rate. 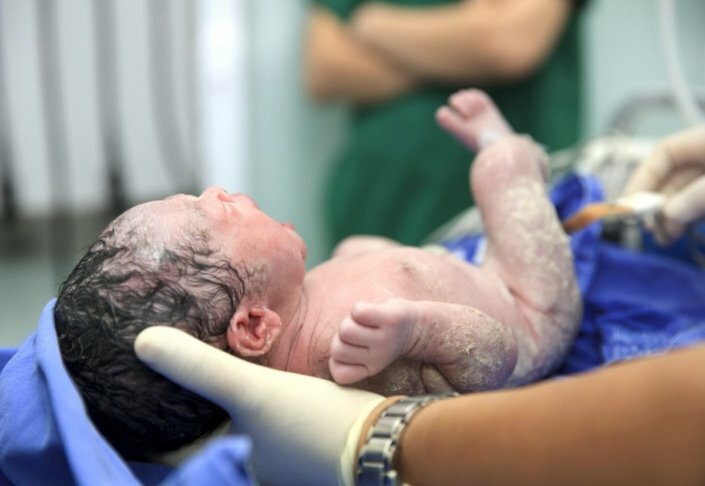 During delivery or at birth, meconium can be seen in the amniotic fluid and on the infant. If the baby has trouble breathing, the doctor will listen to the newborn’s chest and do a blood gas analysis. With MAS, it will show low blood pH, decreased oxygen, and increased carbon dioxide. A chest X-ray may be done to find patchy or streaky areas in the baby’s lungs. Can meconium aspiration syndrome be prevented or avoided? A pregnancy that goes past 40 weeks. Diabetes or high blood pressure in the mother. A long or difficult labor or delivery. Decreased oxygen to the infant while in utero. Early detection is key. A fetal monitor can detect if your baby is experiencing stress. If your doctor thinks your baby may have inhaled meconium, a special care team should be present during delivery. If after the baby is born, he’s active and crying, no treatment is necessary. However, if the baby has trouble breathing, the doctor will quickly need to clear away as much meconium as possible to decrease the amount of meconium the baby inhales. He’ll suction the mouth, nose, and throat. Then he’ll insert a tube called a laryngoscope down the baby’s throat and into the trachea to remove any meconium there. Surfactant (a substance that helps the lungs expand properly). A radiant warmer to control his temperature. Frequent blood tests to see if he’s getting enough oxygen. Although MAS can be very scary for parents, most babies will get better fairly quickly. While rapid breathing may continue for several days, it’s rare for a baby with MAS to experiences any long-term damage. However, babies who experienced MAS may be at higher risk for an asthma-like disease called “reactive airway disease.” This can cause wheezing, coughing, and shortness of breath. Will my baby need any extra care at home? Is there anything I should look out for that warrants a call to you? Is there anything I should look out for that warrants a call to 911? Could my baby have any permanent damage from MAS? Are any future babies I have at higher risk for MAS?